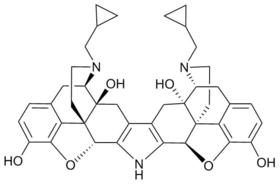 Norbinaltorphimine (nor-BNI or nBNI) is an opioid antagonist used in scientific research. It is one of the few opioid antagonists available that is highly selective for the κ-opioid receptor, and blocks this receptor without affecting the μ- or δ-opioid receptors, although it has less selectivity in vivo than when used in isolated tissues. nor-BNI blocks the effects of κ-opioid agonists in animal models, and produces antidepressant effects.